Malawi Wilddogs watering hole spotted! On our trip december to Lake Malawi, we spotted this pub on the bank of the lake, in Cape McClear. We stopped for a few beers, but no wilddogs were to be found! 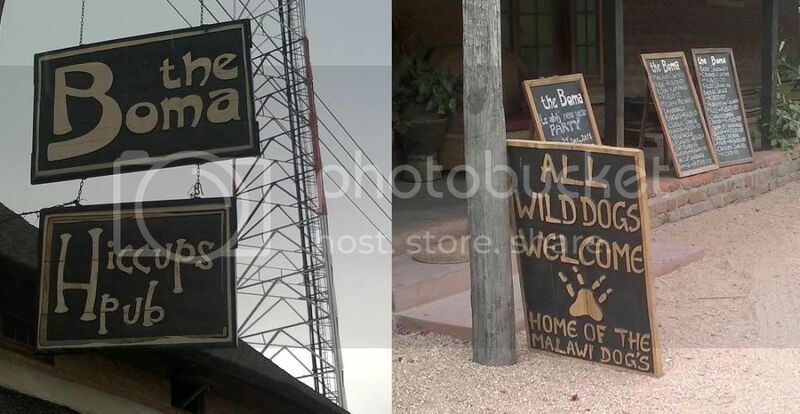 Re: Malawi Wilddogs watering hole spotted! You have the GPS coordinates for this one? I'll have to stop in on my way up. I met the guy, but don't remember his name. He is apparently the only Wild Dog in the whole of Malawi. He rides a 660 Tenere. It's pretty easy to find, just ask anyone for Hiccups Pub. No way?! I was in cape maclear last week, passed by that pub, if only i'd known there was a WD there! was so wishing i had my trusty DRZ cos i had a hair raising ride on the back of a little 125cc with one of the local bike taxi guys from monkey bay to cape maclear . getting to kayak and snorkel in the crystal clear, warm water was totally worth the ride tho! What's up with those hedgehogs anyway? Whay can't they just share the hedge? You really cant miss it when you are in cape mclear. Its one of only two nice pubs there! Really nice atmosphere, cant wait to go back!! on the 24.11.2012 A electrical fault left my Pub in ruins….Hick-Ups pub burnt to the ground all that is left is the walls. We have started rebuilding the place but will only be finished middle next year if all goes well. So anyone coming down I will most probably be around at Fat Monkeys or I will be in Lilongwe, feel free to send me a message when you guy’s are here and we can still have a couple of drinks. Hope you get it rebuilt. Bad luck! Wishing you well with the rebuild - that there will be no "hiccups" and the new pub will be even better than before! Will be making some changes to the bar and restuarant sections, going to be bigger than before. Now you know why the place is called "hick-Up's" lol. Dude, that is such bad news. Hope you get it sorted without too much trouble. Good luck and all the best. Thats terrible! Was looking forward at visiting your pub again! The nice thing is now you get to make it exactly the way you want it!! All the best with the rebuild! Pistol, we will also be at fat monkeys, probably from the 21st or there about. Will be six people in a blue old school kombi! Come and say "high" and we will buy you a few beers! A couple of us are doing a little NAM , ZAMBIA , MALAWI adventure during July , will the pub be up and running by then ? We plan on spending about a week at Cape Maclear . Send us info on how to contact the Malawian wilddogs . If all go well we should have the Bar section done in May, the reasturant midd June, was there this weekend and the roof is starting to go up.